So far 2018 has been a very busy year! Here are some updates of past projects and new…. 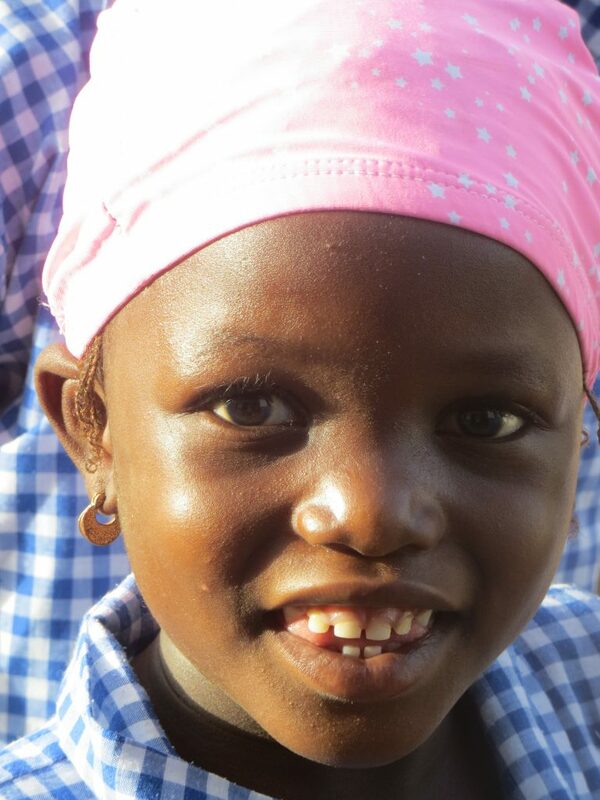 There are currently 90 + children attending the village school. Other work done this year has been to replace the pavilion roof, the kitchen area has been extended and the veranda made good – with a new roof also for the original kitchen building. The veranda by the school classrooms has also had some refurbishment, and the outside of the school building has now had a fresh coat of paint. New shutters have been fitted to some windows that needed them. 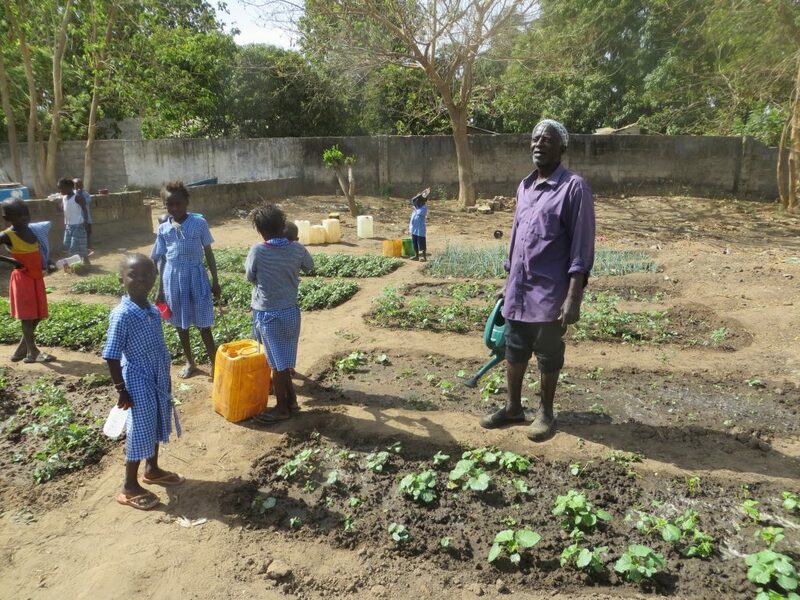 The toilet doors have been replaced and the school garden has had a “makeover” by Fadarbo the school caretaker, with a variety of vegetables and fruit growing there to supplement the school lunches. The dividing wall between the school and garden has been raised and gates fitted… to keep goats out, they sneak in when the school gates are open! We have had blackboard slates donated for the children, and the existing ones were repainted again earlier this year. New lunch bowls, cooking utensils and garden tools have been purchased when they have been required. There is a water tap available for use now in the school, though the well is still used. 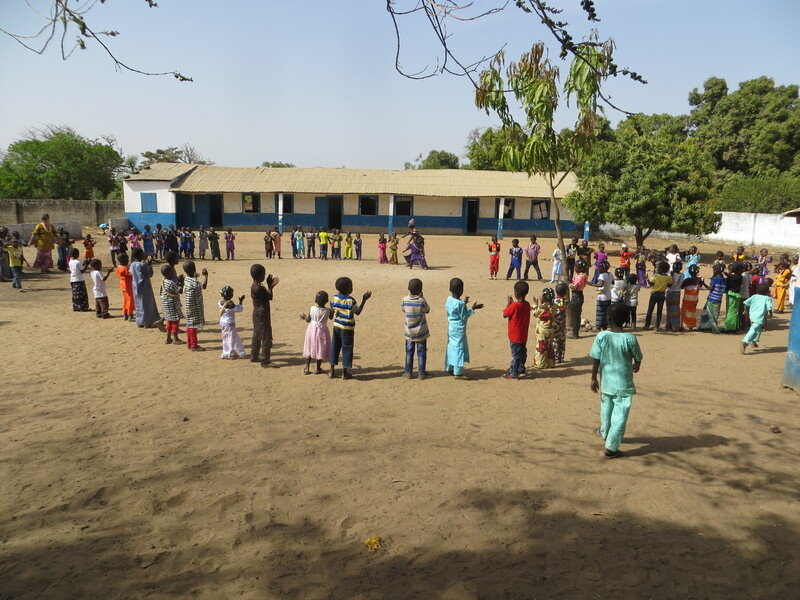 An Early Learning class takes place after the nursery school hours, this is for the older children who will be moving on to Toniataba Lower Basic at the end of the school year. The headmaster has reported that there was great success in the examinations for Home Economics, due in great part to the haberdashery donations from Friends of Si-Kunda. This project to build the centre back in 2007 continues to evolve, and was greatly improved when we installed electricity earlier this year. Electricity came to the village last year, it is by no means available to everyone in the village, but there are now a few street lights, and for the Skills centre it is proving to be a real benefit for all the activities that the building is now used for. The gardens are managed by the women themselves, and they do a wonderful job, with some help from time to time from Sankung when they request it. But now and then they need a little help from us too, and this year we helped with some fencing repairs, and added height to some of the wells in the gardens. There is a borehole and this feeds most of the wells now, also taps fixed to the wells replace the method of dropping buckets on rope to get the water, but some taps needed replacing too. There are in excess of 140 women working their allotments, some having several plots. It is probably one of the best projects we could have taken on. The kitchen was completed earlier this year. The school and grounds look amazing, and very well cared for, with enthusiastic staff to run the school. The school is only 4 years old, but thriving in a supportive community. 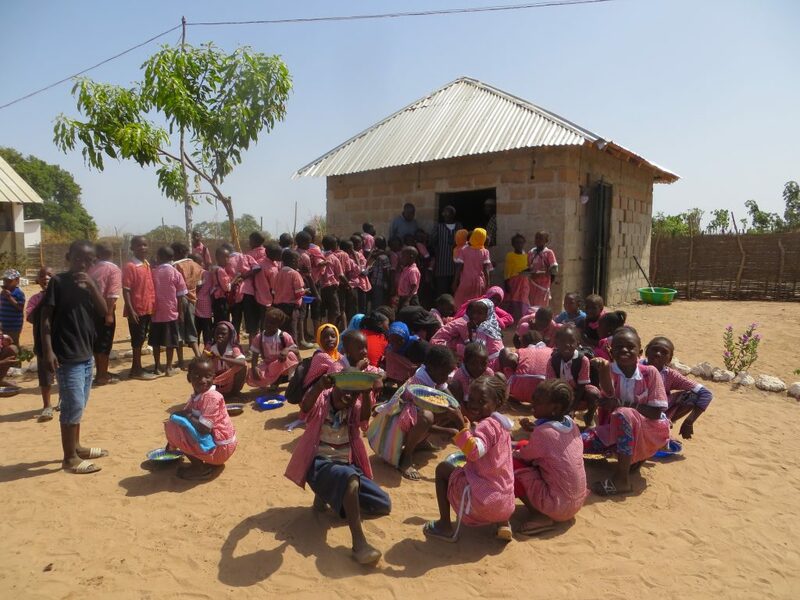 When we first visited they only had grass built classrooms and no materials, so we then provided a toilet block, and soon after the government built them two classrooms and teachers quarters, then a further classroom this year. The villagers themselves built a classroom to accommodate the growing number of students, 337 at the last count!